Keep track of your life. Be more organised. Feel less stressed. – Do you ever feel like your brain is exploding with tasks you need to remember? – Do you write down your to-do lists on different pieces of paper and forget where you left them? – Do you forget that new movie you wanted to see, what you wanted to make for dinner tomorrow night, or what you needed to buy for your new project? – Have you tried to design your own planner, but feel like you don’t have the time or skills to do it? We all have busy lives and a thousand different things to remember. This eventually leads to us feeling overwhelmed and being unable to focus on our actual work. So shouldn’t we remove that clutter from our minds and put it on paper? That’s why I decided to create a system where we could store ALL our thoughts and track our progress. Imagine that feeling of having everything written down, tracked and recorded. 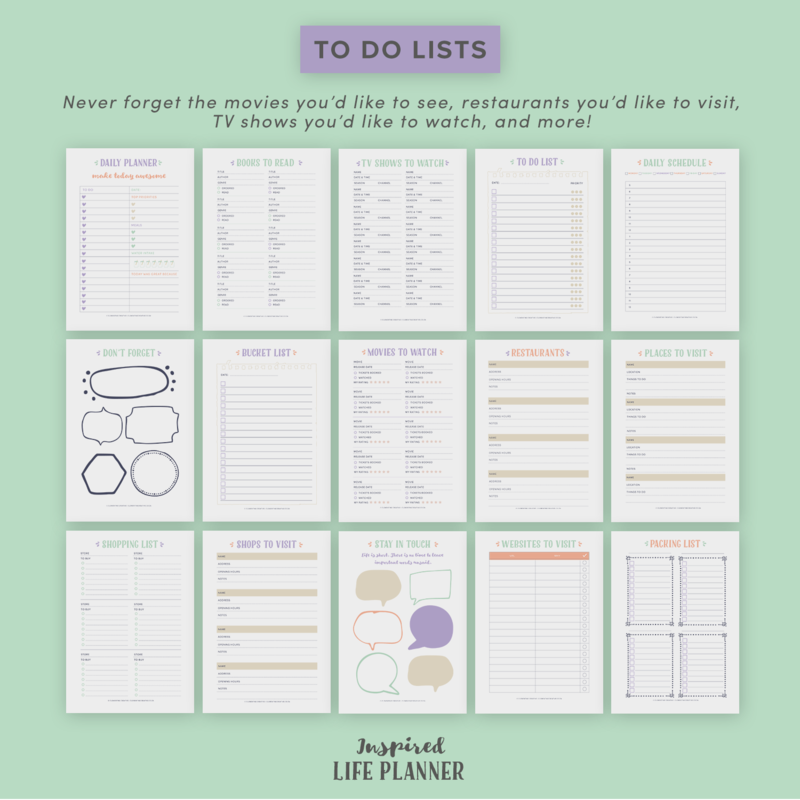 The Inspired Life Planner is going to help you with just that. 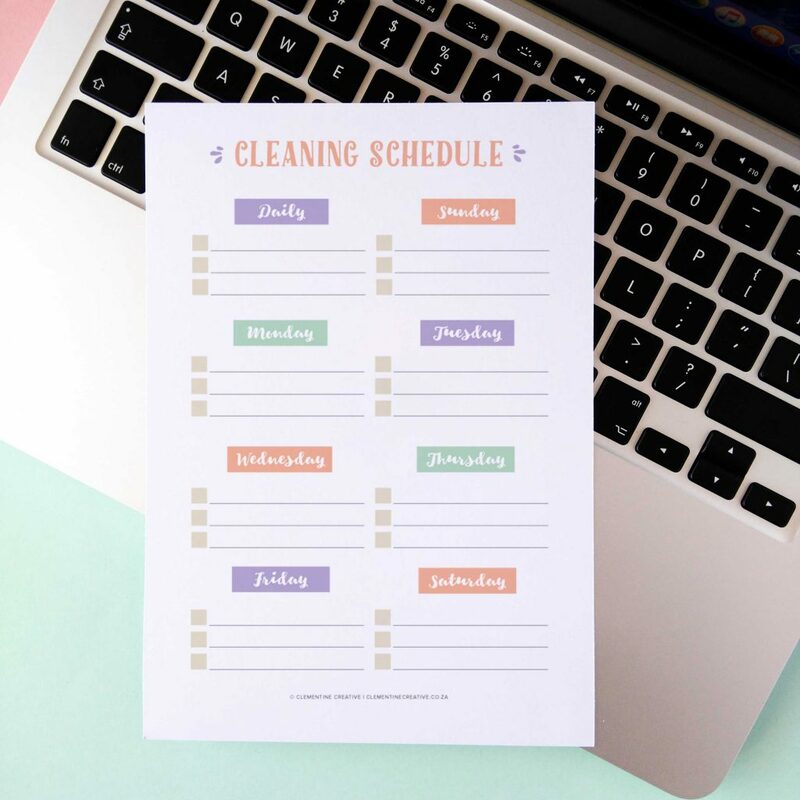 This printable planner includes everything you need to help you keep track of your life, deposit all of the stuff you need to remember on organised lists and as a result, reduce stress and live a happy life. 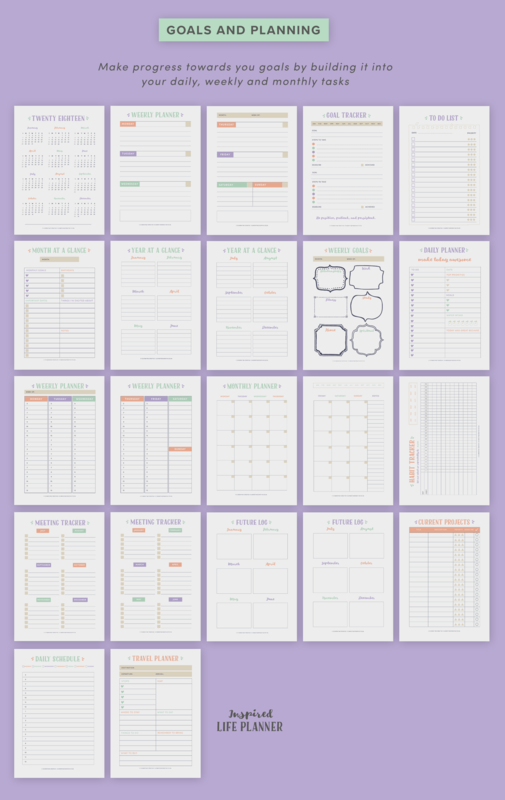 It is a printable PDF planner consisting of various types of trackers, planners and to-do lists. From goals trackers, daily, weekly and monthly planning, to finance, health and fitness trackers. 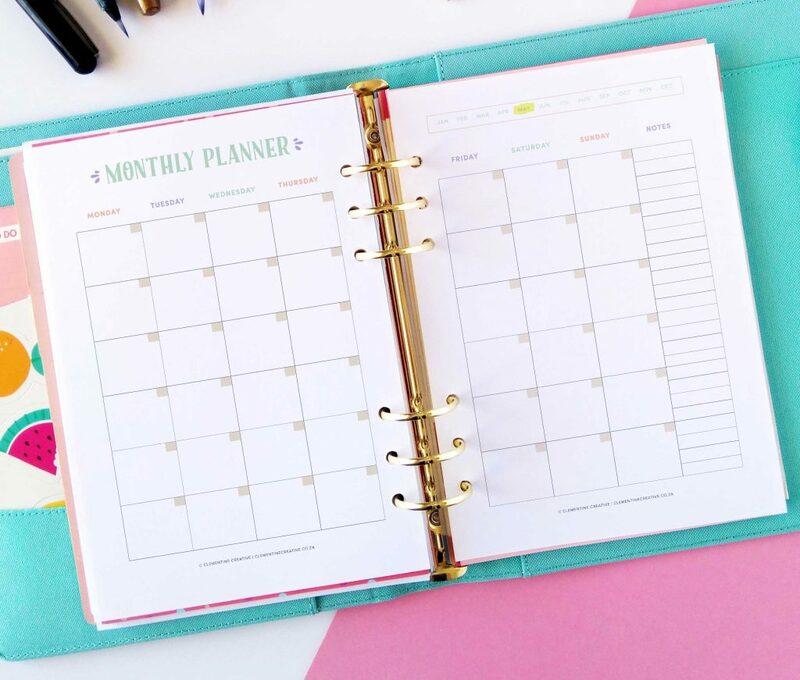 This life planner is going to get you organised in style! Every page was lovingly designed to be functional and pretty. Never forget the movies you’d like to see, restaurants you’d like to visit, TV shows you’d like to watch, and more! Make progress towards you goals by building it into your daily, weekly and monthly tasks. Keep track of your income, bills and spending and see where you can cut unnecessary expenses. 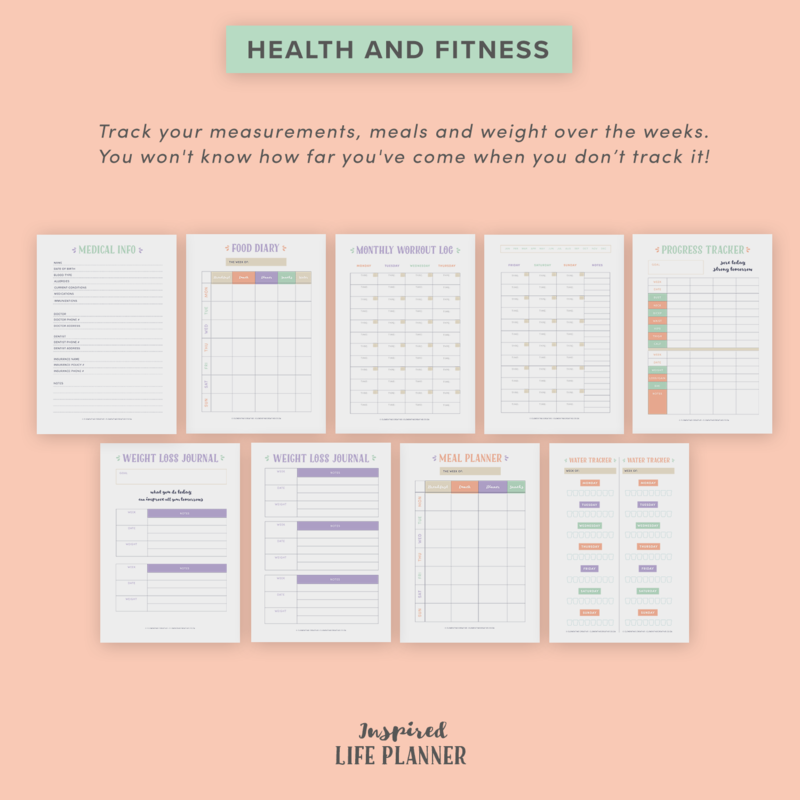 Track your measurements, meals and weight over the weeks. You won’t know how far you’ve come when you don’t track it! 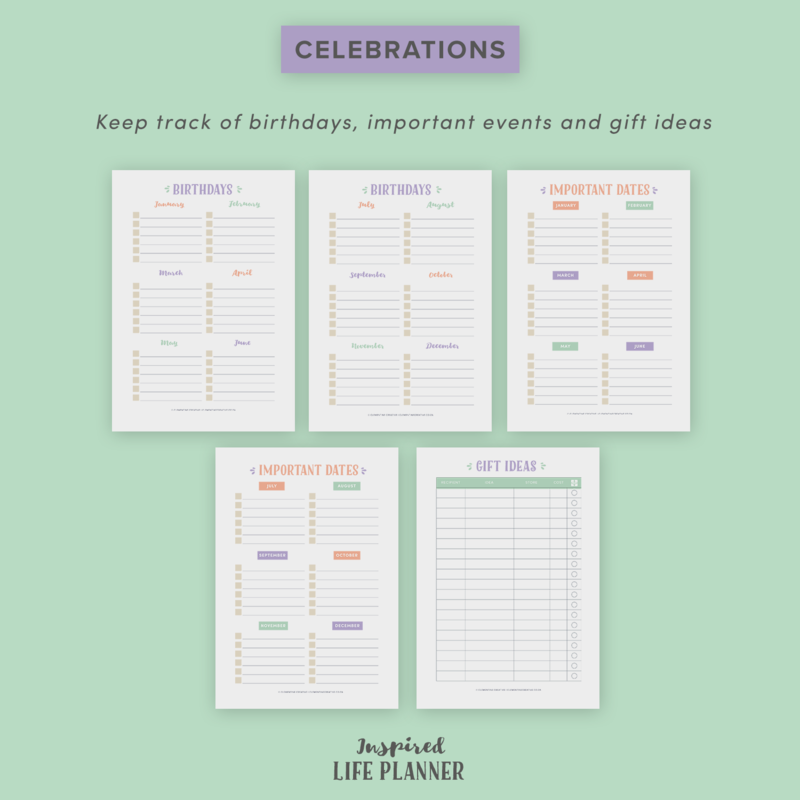 Keep track of birthdays, important events and gift ideas. 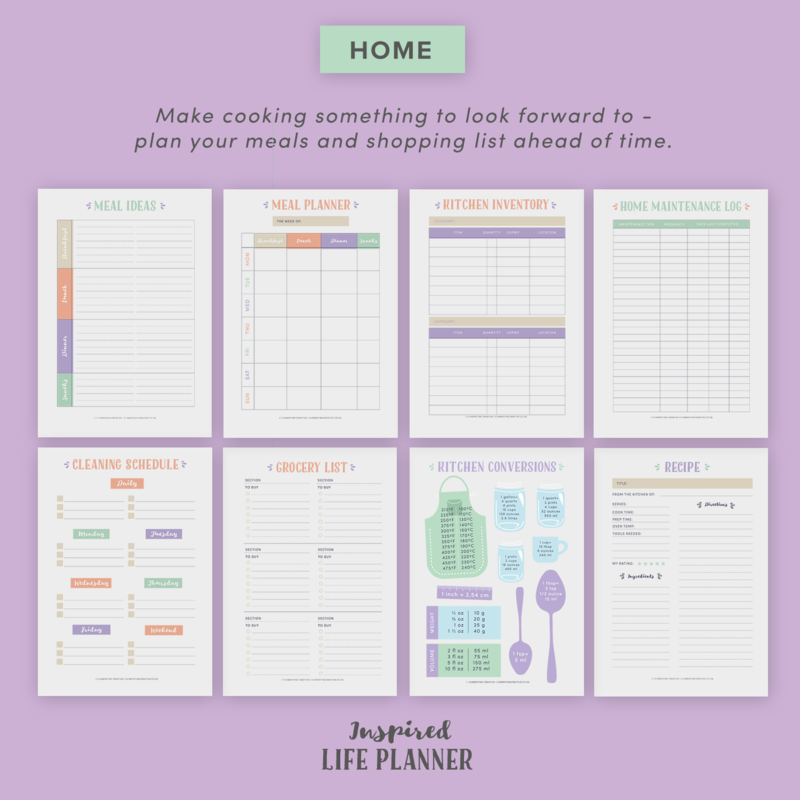 Make cooking something to look forward to – plan your meals and shopping list ahead of time. 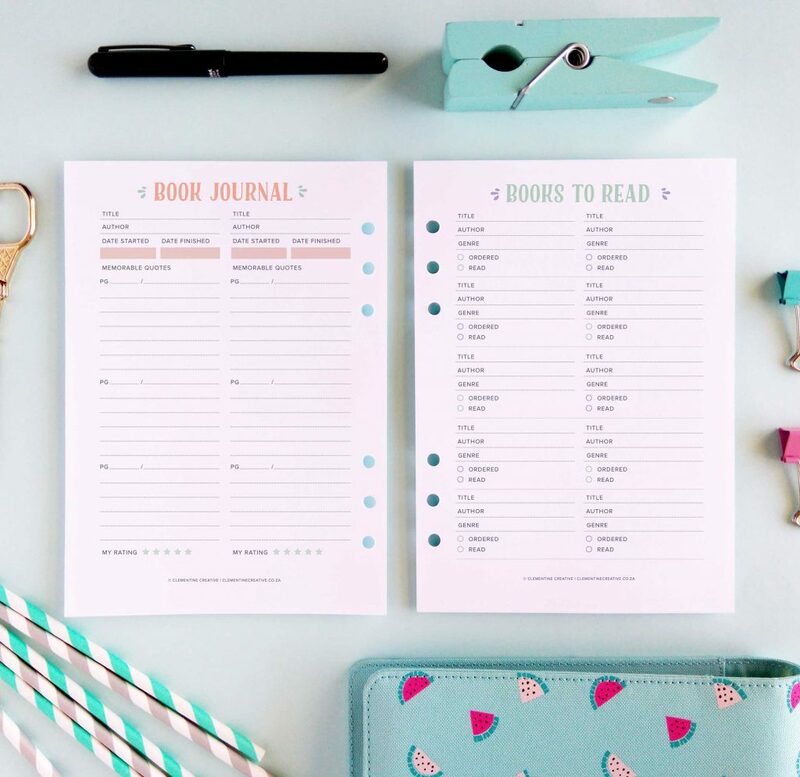 Keep track of personal or work achievements, books you’ve read, your favourite songs and more. Now, you might be thinking: “60 pages are a lot. I don’t need that many pages. My life isn’t so busy.” I get that. Even if you only need 10 pages now, you’ll still get enormous value with this kit. There is no price tag on having a clear mind 🙂 Plus, if you see the bonuses included in this kit, you wouldn’t think twice. Hi! 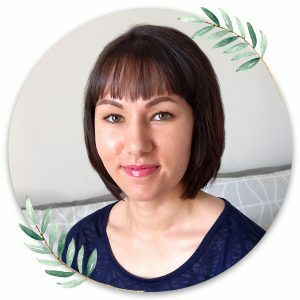 I’m Carmia, the graphic designer behind the Inspired Life Planner. I used to feel overwhelmed with all the ideas and tasks swirling around in my head. I would write down some on different bits of paper, some would be recorded digitally, and the rest I would forget. A recipe for disaster. That’s why I decided to create The Inspired Life Planner, a printable planner kit designed to help you reduce overwhelm and live your best life. 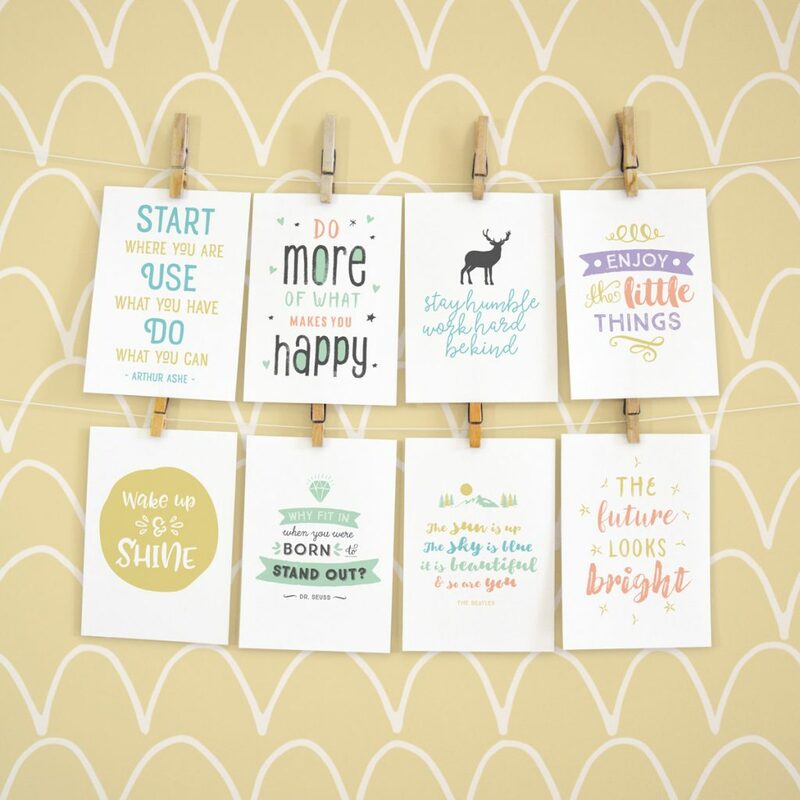 Here at Clementine Creative it is my mission to motivate you to organise your life. 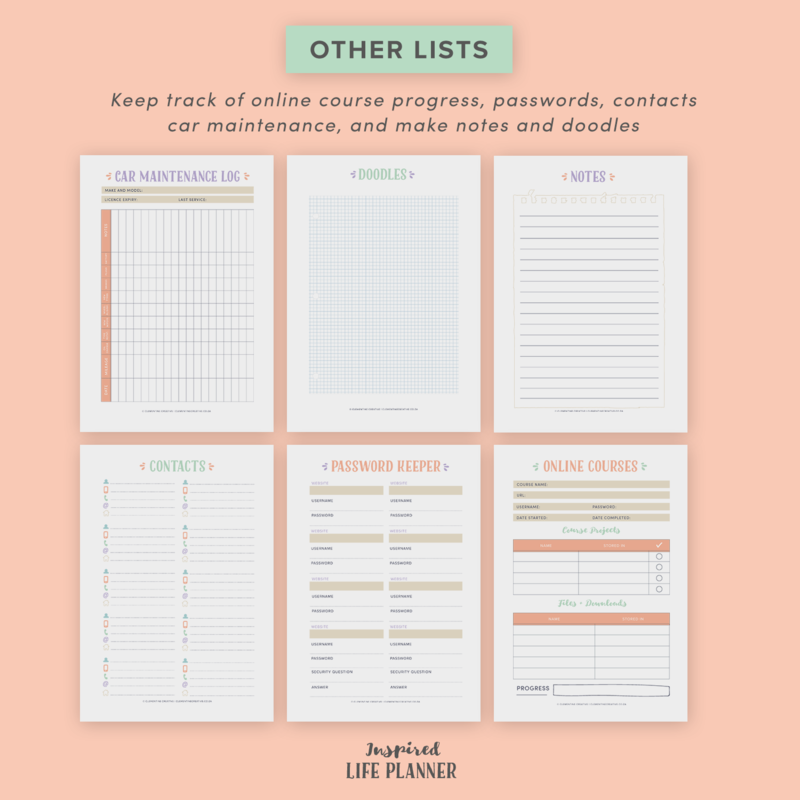 This planner was created with you in mind. Hours and hours have gone into designing it to make it functional and pretty. I hope you enjoy using it and that you find it brings you joy and clarity. "I've searched high and low for the perfect planner and voila! I got it! I love the flexibility of being able to choose which pages to print, mixing and matching the ones that best suits my needs. And to top it all, updates keep on coming! 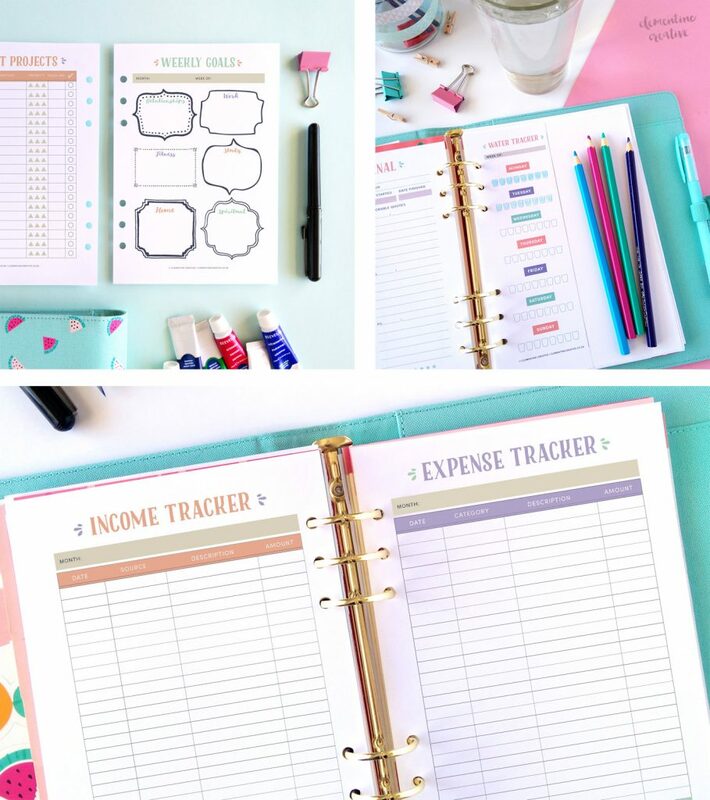 You never have to buy another planner again! Thanks, Carmia, for such an amazing product. I wish you more success =)"
"This is a digital download and that is awesome...I only print the ones I need and can print them repeatedly. The quality is elegant yet classy...I don't care for clutter and there isn't any 🙂 Excellent customer service! I'm still amazed at how easy the transaction went and how quick I had my items. Looking forwards to seeing what else she creates!" 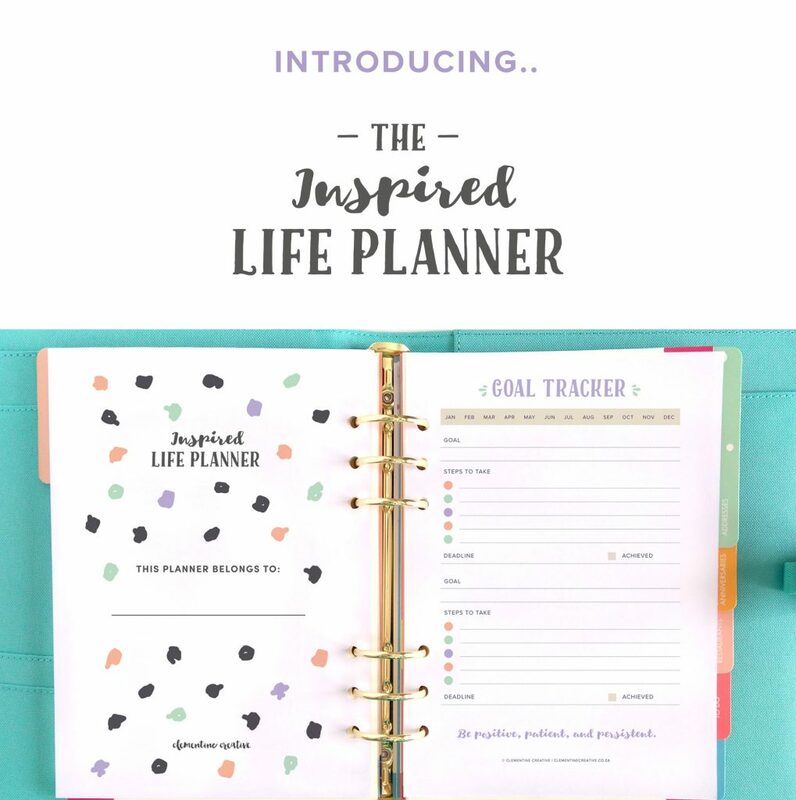 "Thank you so much for my inspired life planner - I'm in love! I spent so long trying to find a ready-bound product that had what I wanted and it just doesn't exist. I tried designing my own planner but with a full-time job and no graphic design experience this didn't work out so well...! 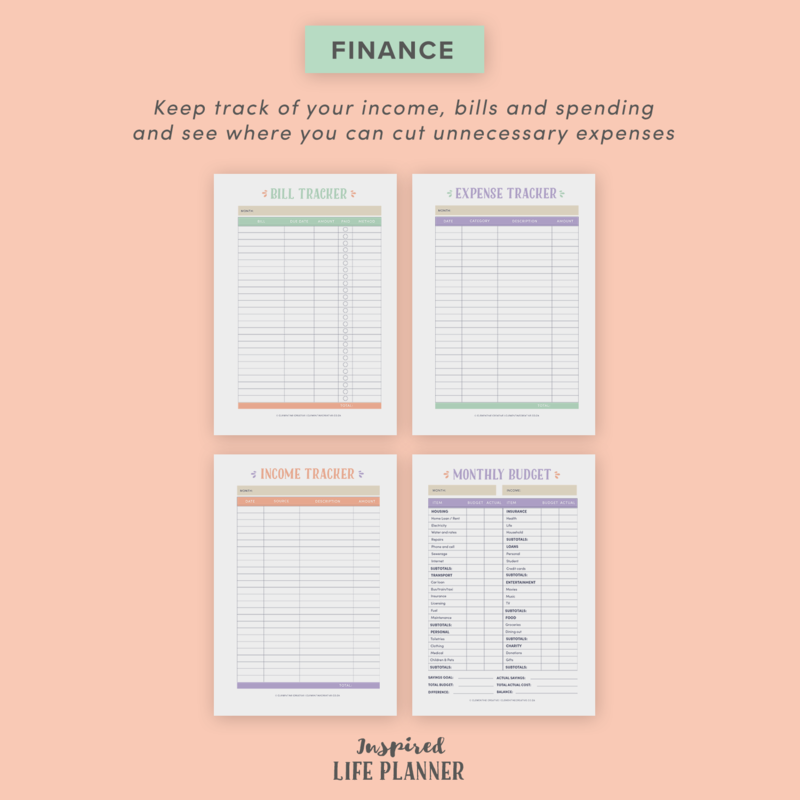 Your printables are therefore perfect 🙂 "
"I couldn’t be happier with my purchase of the Inspired Life Planner. The planner is well thought and well made. 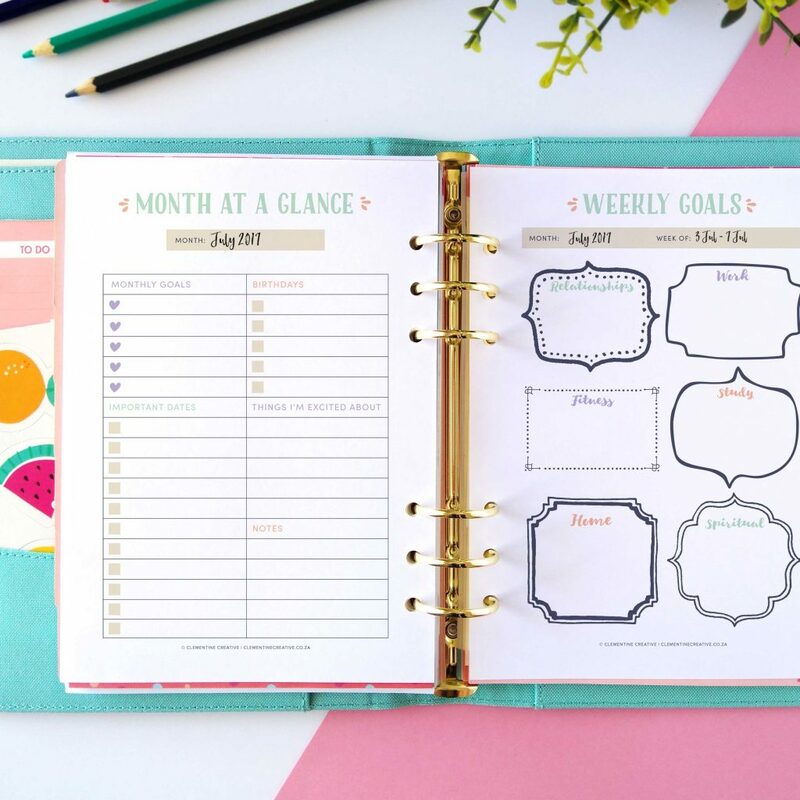 I use the planner for my business and I love the “project planner” page it has which has been broken down into different sections.The instructions are very clear and I love the overall look of the planner. Highly recommended! "I love your planner... Actually it's not a planner, but 1.000 planners in one, you can choose everything and fits perfectly every person... It's a masterpiece made by a person that knows her job. I can't really say "keep going" 'cause it's perfect... So I wish for you a lot of (well deserved) success." "It’s an amazing planner. I was writing down my plans in different files and later I forgot about it. But your life planner is the best thing I found. You made my life organizing easier and faster. Thank you very much. I really love it and I recommend everyone to buy “The Inspired Life Planner”. It organizes your life. I just love it." 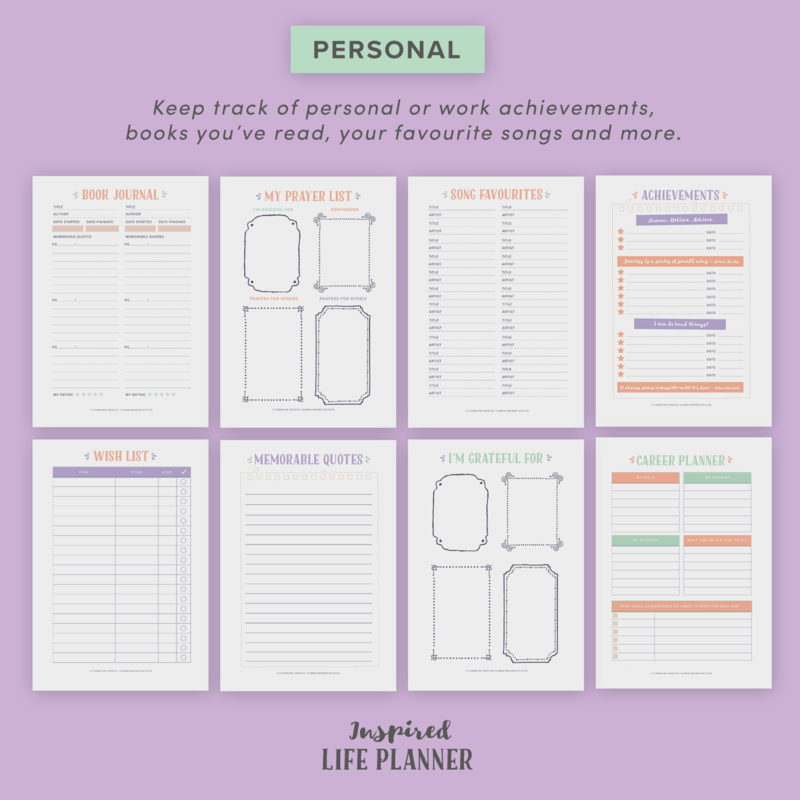 Is The Inspired Life Planner right for you? What ringbinder do I need to place these planner pages into? How will I know if these pages will fit my ringbinder? You can download a free sample here and test it out. 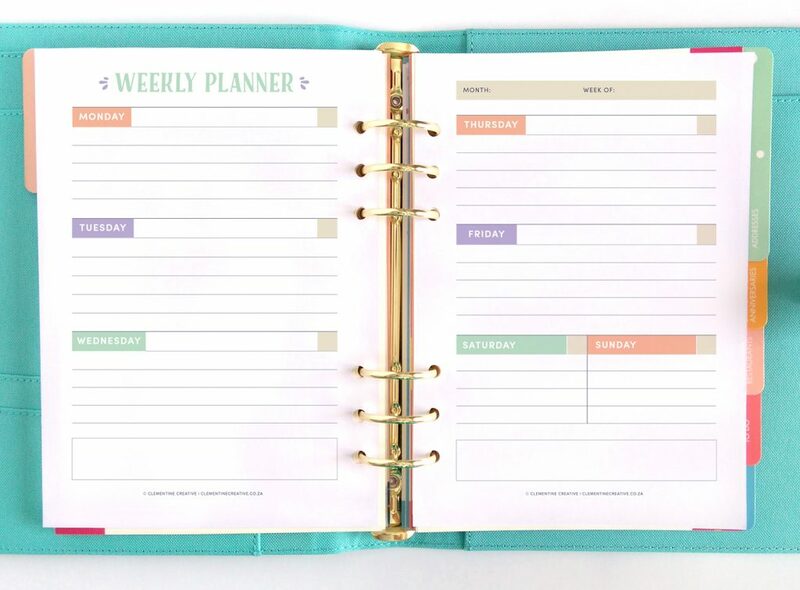 How will I receive this planner and in what format will it be? After your payment has been processed via PayPal you will receive an email with a link download the planner in PDF format. If you do not receive an email, please check your spam folder. Do I need any software to open these PDFs? Yes, but it’s free! You will need to open these PDF pages in Adobe Reader. You can download it here for free if you don’t have it installed on your computer. Is this a dated or undated planner? It is undated so that you can re-use it as often as you like. I can’t / don’t want to pay via PayPal. Do you offer any alternative payment methods? and EFTs (South Africa only) via email. If you’d like to pay via one of these methods, please email me telling me what product/s you’d like to buy and I’ll email you payment instructions. Kindly note that you’ll pay in my local currency, South African Rand (ZAR). Don’t worry, you won’t pay anything extra and you can pay even if you’re in a different country. Payment will be quick, easy and safe to do. I am South African customer. Is it possible to pay you via EFT instead of PayPal? Yes! Please note that I only accept EFT payments, not cash deposits. The price of the planner is R250 for South Africans. Please checkout using the “bank transfer” option and place your order. Bank details will be given on the checkout page. What paper weight do you recommend printing this planner on? Regular printer paper will work just fine, but if you are concerned about your writing being visible on the other side of the paper, you can use a heavier weight paper. 100 gsm (68 lbs) is a good starting point. How do I print these pages to ensure they come out perfectly? Step-by-step printing instructions are included in your purchase. But don’t worry, it’s easy! If you would like to try out a page for free (with printing instructions included), grab one here. Is it possible to type in text on the PDFs or change the graphics? No, this planner is meant to be filled in by hand and used as-is. Can I print these pages on A6 paper? You can, and printing instructions are included, but keep in mind that it will be very small and not very practical. On what day of the week do the weeks start in this planner? You’ll get two versions: weeks starting with a Sunday, and weeks starting with a Monday. Due to the digital nature of this product, I cannot offer refunds. But if you have a problem with your order, please let me know and I’ll do my best to make it right. Is the binder and dividers in the photos included in the purchase? No, the binder, dividers and accessories you see in the photos are for display purposes only. The binder in the photos is the large kikki.K. You will need to purchase your own binder and dividers or make your own dividers. Can I suggest any improvements or suggest new planner pages? Yes! I would love to hear your feedback on this planner. The most popular suggestions will be included in the next version of the planner. Please note that I cannot guarantee that your suggestion will be included. Does this planner come in Personal size? There are no plans at this stage to convert the planner to Personal size. It will not be practical to use as the writing space will be too small. Please note: This is a digital item. You will not receive a physical item in the post. The binder, dividers and accessories you see in the photos are for display purposes only. If any of the pages in the planner get updated or if new ones are added, you will get them for free! 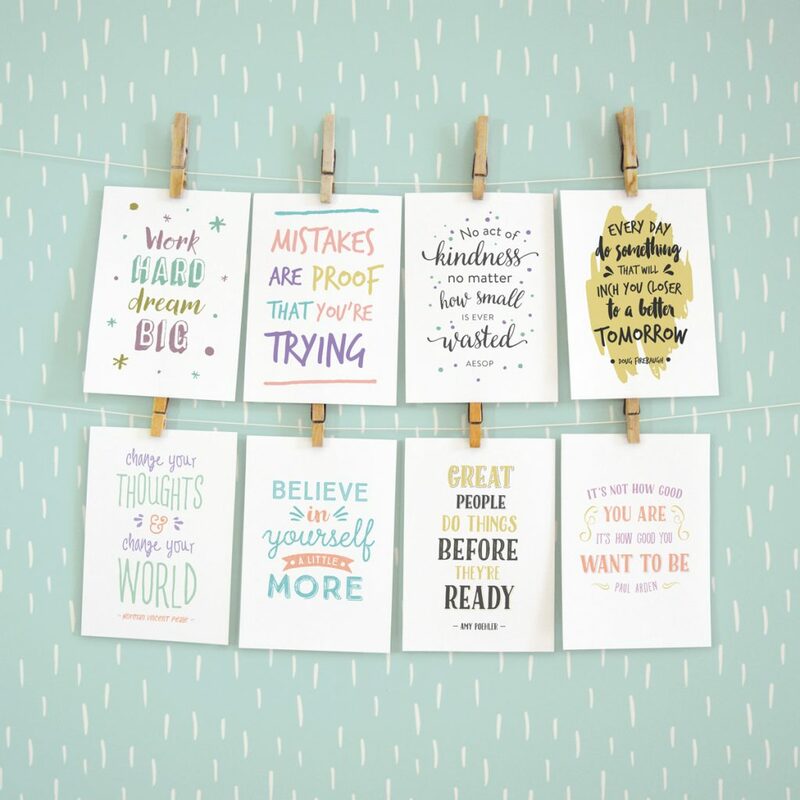 It isn’t called the Inspired Life Planner for nothing 🙂 With your purchase you will get 16 beautiful inspirational quotes to place in your binder, stick on your notebook or your wall, or to frame. Ready to have a clutter-free mind and an inspiring life?